I remember being in marching band in high school hearing “Flagpole Sitta” on the cheerleaders mix tape across the field. The days were hot and long and the girls had at least a 15 song mix, and I got to hear this song blast out at least 3 times, a respite of cool indie pop in the midst of the nightmare of band camp. When I was a kid, I used to think “Flagpole Sitta” was called “Paranoia,” which made the song slightly inaccessible based on the fact that in the pre-internet ubiquity days, you needed to really have your information and research down on stuff you liked to track it down. 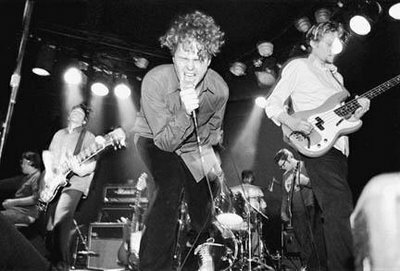 “Flagpole Sitta,” as its known, was a fantastic one hit wonder from the band “Harvey Danger,” a thrashingly nerdy Seattle rock outfit that rose to prominence in the 90s alternative rock movement. The song is an anthem of catchy angst and rebellion directed towards the all invasive commercial culture that clearly won in the end. The other song, “Sad Sweetheart of the Radio,” was their second single from their next record, King James Version, and was a pretty big flop, dooming them to one hit status. It’s still a great song, with crystal clear production and an exciting melody and vocal performance, but the subject matter was so bizarre that it’s clear to see why it didn’t catch on. It’s a shame because it’s funny and it rocks. They made a small comeback in 2006 with Little By Little…, a free internet release. It had some awesome songs, including the fantastic rock rave, “Cream and Bastards Rise.” The video for that one is made by some guy testing out his animation tech, and is no way official, but its still cool and worth checking out. So, here you go, the three big songs from Harvey Danger’s three albums. Powered by WordPress v 5.0. Page in 0.484 seconds.